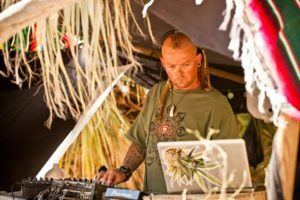 Over 2 decades developing his own unique approach to Psychedelic music, Seamlessly melding genres such as Techno, Minimal, Zenonesque, Breaks, Psy-Dub, Glitch, Mid-tempo, Downtempo, No Telling where he will go with the sound always pushing limits. Focusing on a sound thats diverse, refreshingly experimental, yet accessible and dance floor friendly at the same time.. The leading influence of the music dynamically spearheads along a forward-moving groove, and there is so much space between the notes that the invitation to internally engage is simply irresistible. For all the richness in the sound, it is profoundly spare, as well as jam packed with mindful and content. A blessing experience on the dance floor, full of details and cutting edge drive simply called by him as Intelligent Music.